← What Do Crime Scenes Tell Us? Are you the type of person who always has the latest apps downloaded to your smart phone? Or, do you consider yourself someone who doesn’t see the excitement in using your cell phone to do anything besides make a call? Either way, if you are a parent of a small child you might be interested in this new offering from the FBI. 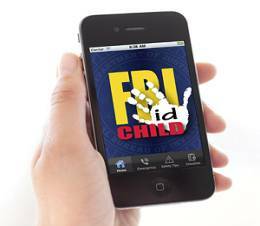 The “Child ID” phone application, which currently is available only for iPhones, allows you to download photos and essential physical information about your child that can be shared with mall security, police officers, the FBI, or any other members of law enforcement who may be able to help you in the moment that you child goes missing. For anyone who has ever gone just a few seconds without knowing where their child was, you know the sense of panic that can set in. Simply being asked to give your child’s hair color can seem overwhelming when your head is spinning with the possibilities of what has happened to him or her. If you can remember that all of that information is stored on your phone, a quick push of a few buttons can have critical details out where they need to be. This application is free and the FBI plans to expand the service to other platforms in the future. Many applaud this move as a great way to keep our kids safer. There are some, though, who believe it instills an unnecessary state of fear in parents. Writer Lenore Skenazy says that in a country in which only 115 children are abducted by strangers every year, this app can make parents think that child snatching is happening every second of the day. What do you think? Is this a safety tool you will be purchasing for your phone and family? This entry was posted in crime and tagged author jennifer chase, child ID smart phone, child safety, crime, fbi, missing kids, phone app. Bookmark the permalink. Have you heard of the pantyhose killings? Our society is really becoming more violent all the time and women need to know how to protect themselves. I’m a student of Psychology and this information was given me. The information given me was that this occured in the early 1970′s. The victims were all university girls. The victims were all wearing micro mini-skirts and pantyhose. The killer would hide inside their apartment. As soon as the girl would step inside the door, he would grab them and place them on the bed. He would put a pillow over their face and began suffocating them. He would revive them and smother them three or four times over. After smothering the life out of his victims he would remove their pantyhose and keep them for a sick trophy. The girls were not raped. They were found fully clothed with the exception of their missing pantyhose. The pantyhose were never removed until after he killed his victim. A classmate of mine emailed me this video that shows how depraved many are within our culture. We are studying the dark element within the human mind. Thanks for your comments. No, I haven’t heard of the pantyhose killings in the 1970s. Unfortunately, there are so many cases that we don’t hear about unless it’s in our area. Has the killer been found? I assume that these cases have gone cold. It does seem that our society has become more violent. I think for the most part it has, but also we hear about so many things more now with the Internet, TV, and other types of news where it seems like we’re more violent. Good luck with your psychology course. You’ll learn a lot. Be sure to check out other books that are cited in your text for more information.